You are here: Home / Awards / Stronghold Engineering receives ABC STEP Diamond Level Award. One of the greatest feelings of satisfaction and success is not only being able to complete a project to the highest degree of quality, but for a construction company to be able to send their workers home everyday without any type of serious injury. Leading the way in jobsite safety, Associated Builders and Contractors (ABC) created the Safety Performance Report to study and analyze the correlation between safety measures companies take to keep their workers safe (leading indicators) and the number of incidents, accidents and injuries that occur on the jobsite (lagging indicators). The report generates 35 specific data points, which are then collected and sorted by the U.S. Bureau of Labor Statistics (BLS) for the Occupational Injuries and Illness Survey. The data in turn is used to compare the STEP participant performance against the BLS industry average incident rates. Since 1989, ABC has been researching and studying how to improve jobsite safety through STEP, and the data gathered through this program helps provide tools for STEP participants to become more proactive in eliminating injury and hazardous scenarios. Currently, STEP participants are performing 130% safer than the industry average with Platinum Level companies performing 400% higher and Diamond Level companies performing 670% higher than the industry average. Stronghold Engineering has always prided itself on setting a standard in safety with their employees and continues to practice and promote safe practices that have allowed the company year after year to achieve Gold and Platinum Level awards in the ABC STEP program. Working to achieve the highest level of quality on all projects while maintaining the upmost respect and self-awareness towards jobsite safety continues to positively move the company forward in a world where distractions and hazards are constantly present. 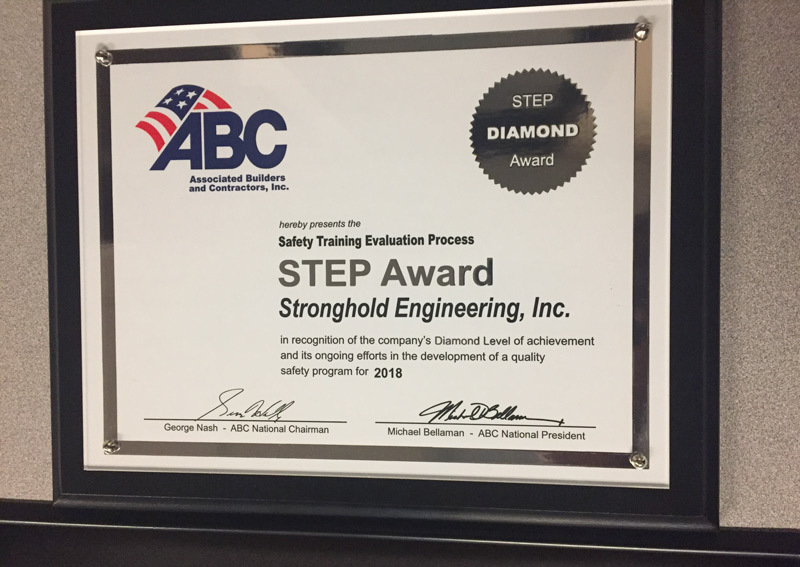 By setting these standards, Stronghold has achieved for the first time the highest level of recognition in the STEP program, receiving the Diamond Level Award. The Diamond level recognition makes up only 13% of the STEP program participants who have achieved a Total Recordable Incident Rate (TRIT) of 50% and below, and Experience Modification Rate (EMR) of 0.7 and below ( Stronghold EMR = .55 ). With the highest standard set and achieved, Stronghold looks forward to their continued success of building construction excellence and maintaining the highest priority towards safety.